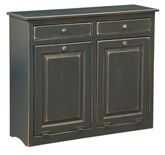 Pictured in pine with Navy paint. Pictured in pine with Spicy Mustard paint. Treat your veggies like you treat your family. Keep your loved ones eating healthfully and your vegetables fresh and organized for cooking time. This veggie bin will keep your favorites stored to maximize freshness. The bin has three drawers: two in the front and one on the top. These will ensure your different kinds of vegetables will stay separate and will last longer—helping stretch your grocery dollars. One of the largest trash bins available, this model has two compartments With two doors with bottom hinges that fold out, you can stow the trash of even the busiest families. This bin will keep trash bins out of the reach of children and pets and the smells will be more contained. The top shelf provides extra counter space for fresh flowers or decorations. Keep your garbage out of sight and reach from your household with this wooden cabinet. With a single door with bottom hinges that fold out, you can store and hide a garbage can. The top shelf and drawer provides extra counter space for fresh flowers or a bowl to hold your keys. For a great way to manage your house’s garbage, the Mission Tilt Out Trash Bin is ideal.Â With a single door with bottom hinges that fold out, you can store and hide a garbage can. Slightly larger than the average wooden trash bin available through Amish Furniture Factory, this Mission style option stands alone as a beautiful piece of furniture in your kitchen. With a single door with bottom hinges that fold out, you can store and hide a garbage can. Not only will this medium sized tilt out trash bin keep your food out of sight for appearances but it’s also more hygienic if you have little ones or nosy pets.Â The top shelf and drawer provides extra counter space for fresh flowers or a bowl to hold your keys. Keep that sometimes unsightly garbage bin out of sight from guests and out of the hands and paws of your children and pets. The bottom half has a door that opens up to stow your garbage bin. Not only will this large tilt out trash bin keep your food out of sight for appearances but it’s also more hygienic -- you won't have to worry about your little ones getting into the waste. The top shelf and drawer provides extra counter space for fresh flowers or a bowl to hold your keys.